Elegy is a modern, dependable tool for the concert hall. It's solid, lattice-braced top has a traditional timbre with a fundamental resonance that remains salient and rich in the toughest performance settings. The design combines my own unique views of construction with those past and present - many of whom I consider friends. * I cut every top to the highest standard, but after milling through a couple of flitches there are always a few top plates that stand out from the rest. These tops are reserved for customers that want to pay more for the best cut of wood that comes from a particular log segment. Custom Woods -- Unique back and side wood requests add to the final cost depending on the price of the wood in question. My method is an inward subtraction of density from the top that is then tied into the much thicker edges via my own lattice-like bracing. I find this balances the efficiency of both light and heavy strokes, giving the player a “quick attack” without sacrificing depth, warmth and power. I decided on this approach after playing a guitar made by Hugo Cuvilliez. I normally laminate the back and sides. The sides are laminated with the goal of increasing weight and the back is laminated with western red cedar. I highly recommend this to players looking for a very focused, salient projection and excellent separation between voices. When I first started using a bolt on neck I was merely fastening the heal. My friend and luthier Jeremy Clark inspired me to try bolting the fingerboard as well. This makes the entire neck removable, seriously facilitating finish work and any restoration that might be required as the instrument ages. Fantastic guitarist and teacher Stanley Yates first encouraged me to try out "Jumbo" frets and I have been using a large fret width and height ever since. Overall, this is a major improvment in the playability of a guitar and the sustainability of the instrument's setup, preventing string ware in the fretboard and ensuring that minimal effort is required for the player to fret a string. 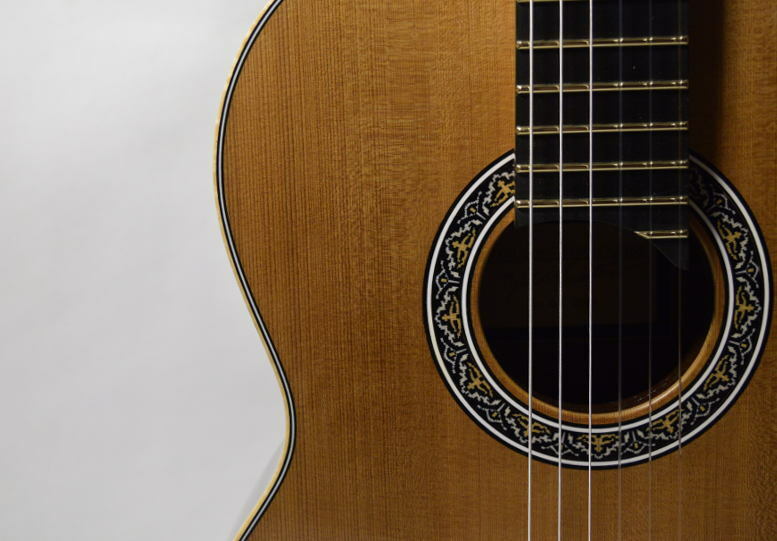 The elevated fretboard is now a standard in the classical guitar world. I use only a minimal elevation (1/2") that gives players an easier access to the frets over the guitar body. This is acheived by increasing the neck angle 1/2 a degree and lowering the upper-bout so the string distance from the top remains in a traditional range. Although it's quite labor intensive, French polishing shellac is a great solution for small shops and is remarkably easy to rejuventate. I have enjoyed using polishing touch ups as an excuse for building stronger friendships with my customers and it's a great way for me to check in on how my older guitars are holding up. When I expand my shop one day, I plan to offer other finish options, but for now, I enjoy finishing without all the health problems that could arise from modern solvents.